CoLab Radio » Blog Archive » Delhi: From Walled City to "World City"
There are some interesting parallels to draw between Delhi a hundred years ago and Delhi today. Amazingly enough, these two cities have more in common than they ought to. In 1911, Edward Lutyens took on the task of building a new city as a symbol of the imperial power beyond the old walled city of Delhi. At that time, the men and women working as construction labourers for the new capital had no place in it and were forced to live in the already congested Delhi, or the outskirts of the city. Though Delhi’s new aspiration to be a “world city” has led to large investments, the city still finds itself unable to meet the basic needs of a majority of its inhabitants. Instead these residents live in slums in the city centre that are constantly under threat of demolition, or they reside in relocated slums in the outskirts. Although India has moved from colonial rule to independence since 1911, the colonial attitudes of exclusion linger on. As early as 1951, India’s first Five-Year Plan highlighted slums as a national problem. The next Five-Year Plan emphasized that any policy dealing with slums should ensure a minimal displacement of slum residents. However, the slums of Delhi grew at such rate that by the late 1990s, despite efforts at planned development, Delhi had 3 million people living in 1,000 slum clusters. This resulted in a new slum policy direction that encouraged slum removal and relocation outside the city. 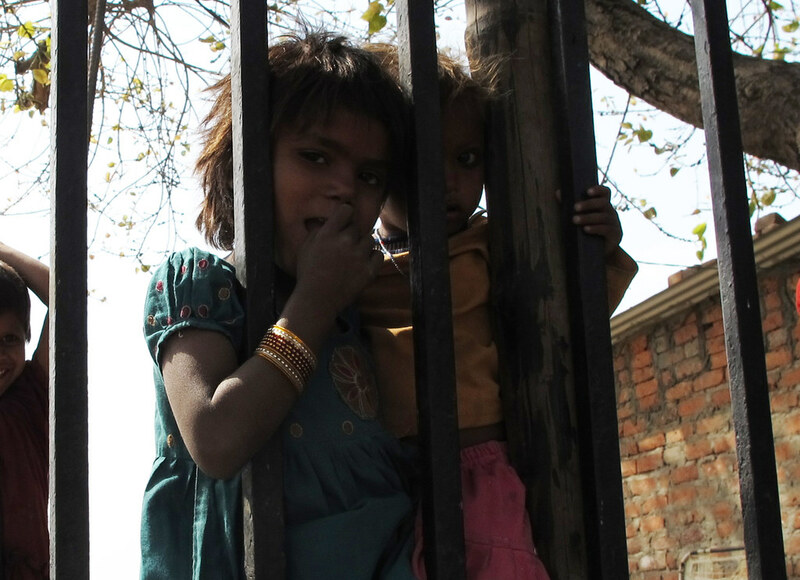 Between 1998 and 2010, estimates show that the government displaced 1 million poor people in Delhi. Though exact figures of today’s slum population are difficult to calculate, there are measurements that indicate that of Delhi’s 20 million population, 52 percent live in slums, and that the city’s slum population is growing at a rate of 4.5 times greater than the non-slum population. Since 2003, Delhi has undergone major efforts to tidy up the capital and become “a world class city” in preparation for hosting the Commonwealth Games in 2010. 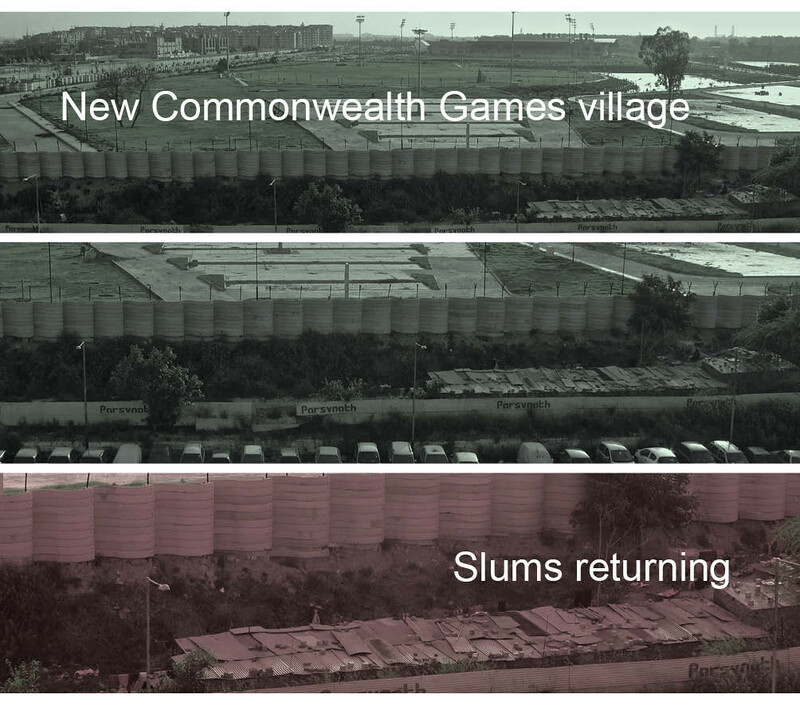 One of the earliest and largest slum clearance projects in the wake of the Games was the Yamuna Pushta settlement. Sprawling along the banks of the Yamuna River in central Delhi, the informal settlement of 280,000 residents was one of India’s oldest slums. In 2004 however, a brutal eviction took place in order to transform the area into a recreational strip and promenade that would connect the Yamuna to the Red Fort and other national memorials. Within a matter of weeks, the government flattened the whole Yamuna Pushta settlement and thousands of people became homeless. The demolitions happened with little or no notice at all. 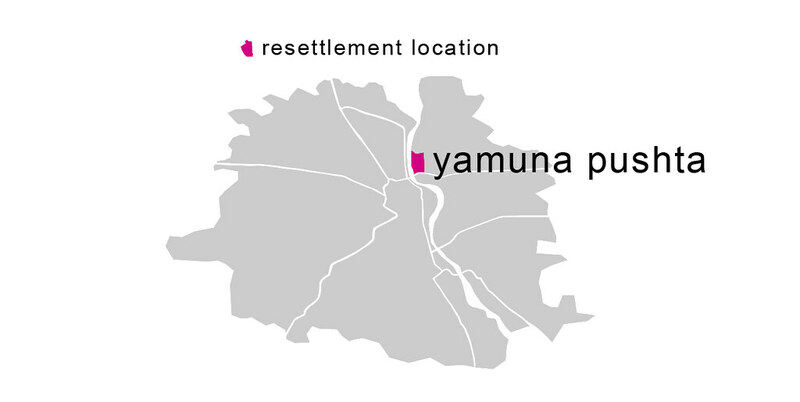 In official documents, tearing down the slum area was justified as a step to avoid flooding of the Yamuna. The thought was that designating the area as a green space and restricting construction would solve the problem. However, those arguments did not stop the authorities from locating the entire Commonwealth Grounds there, or from constructing a 30-acre temple complex. As a result, the flood prone areas gained even higher risk of flooding, and a number of other developments also sprung up, including a Metro Rail Depot and station, an IT park, an electrical sub-station and a shopping centre. For those residents of Yamuna Pushta that could prove their permanent residency in the area, the government provided simple compensation housing in the peripheral suburbs. However, the residents who were able to benefit from this program were just a fraction of the total displaced. For those who qualified, life conditions improved only marginally. In the demolition process, not only did people lose their homes, but they also lost their workshops, boutiques and markets. A shift to a distant suburb generally meant lost connections to social networks, jobs, city services and incomes. Instead, they faced new costs in the form of transportation and commuting time, and research shows that evicted slum dwellers of Delhi decreased their average incomes by about 50 percent as a result of the eviction. Miloon Kothari, an UN reporter on housing rights, has expressed his disbelief in the way the demolition process has developed, arguing that it has created an apartheid city separating the rich from the poor. He says the situation in the resettlement areas is horrendous, distant from jobs and city services. Not surprisingly, resettling projects like this have received more and more criticism internationally. Accordingly, slum upgrading projects have increasingly replaced slum resettling projects, in which living standard and services are improved in situ. This way, fewer people have to move and projects don’t set off a domino effect of relocations around the city. Many NGOs have taken up this idea and now work with bottom-up approaches rather than the conventional top-down methods. Grassroots movements and community participation are crucial parts of this process. 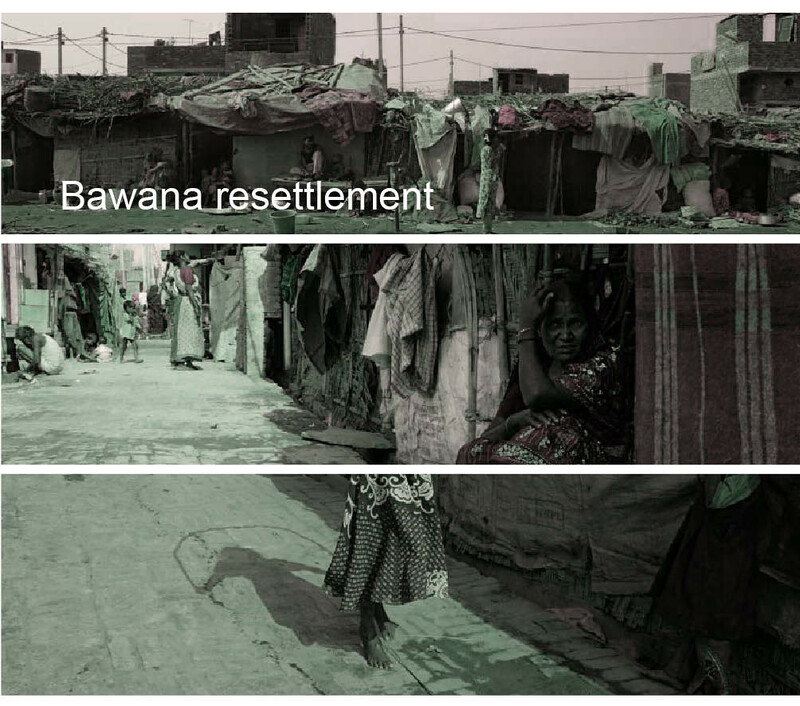 Where resettlements are unavoidable, the basis of deciding the resettlement location emerges from an in-depth analysis of people’s living patterns. Today, there are numerous slum upgrading projects taking place around the world, although still in small scale. Aid organizations, NGOs and governments are all using different approaches to provide housing for the urban poor. Our hope is that this approach eventually will become more established and replicate on a larger scale throughout cities in the developing world, including Delhi. In the end, a capital claiming to be a “world city” should be able to plan for the poor, just as it does for the rich. Allowing India’s affluent to settle in the attractive areas of Yamuna Pushta while driving away the poor is a practice more reminiscent of 1911 than 2011. According to @nickygavron on Twitter, something similar is happening at London’s Olympic Park – http://tinyurl.com/6knh67d . These are two different contexts, but both seem to make some people ‘disposable’. Thanks for the post, Johann and Stina. Alexa: Thanks for highlighting the fact that this is something happening not exclusively is slum areas in the global south, but in developed cities like London too. Although the means and circumstances are different, the outcome of gentrification and “beautification” is the same. These tendencies are very evident in the Indian city of Bangalore where our project is based, and we will discuss these issues further in our future posts! I love the gorgeous graphics in all of your posts! I think you guys know this already. To me, what is particularly striking about this is how larger institutions shifted their rhetoric so quickly, leading with the justification that they had to clear the slum because of its risk of flooding, but then doubling back on this logic by building a huge development right on the same land. It makes me wonder when governments worldwide will recognize that the way to improve people’s lives is not by tearing down their homes, but by meeting their needs. I am very interested to hear more about the “slum upgrading” projects that you see as better models. Thanks Stefanie for your comment! So far on this trip, we have only read about great ideas on slum upgrading, but haven’t seen any exceptionally good examples in real life. There are a lot of projects with good intentions and satisfactory housing standards. In terms of urban planning, however, many of them merge very poorly into the context of the city. They are built like new enclaves rather than integral part of their surroundings. In a couple of weeks we are moving on to Mumbai (aka “slumbai”) where some of the world’s largest slums are situated. A lot of NGO’s are working with slum upgrading issues there and we are hoping to find some inspiring examples. During our stay in India, it has however become evident that there is more focus on the actual houses in slum upgrading projects than the urban planning. This is quite interesting and makes our study even more exciting!